Outside of Champagne, few wineries admit blending Pinot Noir, and when they do it's usually in a low-end wine. Marichal winery in Uruguay makes two exciting blends of Pinot Noir I hadn't previously imagined, much less tasted. The first is a commonplace blend for bubbly, Pinot Noir and Chardonnay, but I don't think I've ever seen it in a still wine. Marichal Reserve Collection Uruguay Pinot Noir Chardonnay blanc de noir 2012 ($16) is a very light pink that tastes like a fairly full-bodied white wine (though just 13% alcohol) with a few pink notes. Rarely do you taste leesiness and tannin in the same wine. It's not fruit-driven, but fresh, with great texture. You taste fresh vanilla bean on the finish (the Pinot Noir, 65% of the blend, is all barrel-fermented) and you have to strain to taste a little strawberry. The closest thing to it are white wines made from Pinot Noir in Oregon, which I love, but this is more Chardonnay-like than those. "We wanted to make a Pinot Noir, but we thought on its own it didn't have enough acidity," says Juan Andrés Marichal. "It wasn't interesting. Not enough character. So we added Chardonnay." 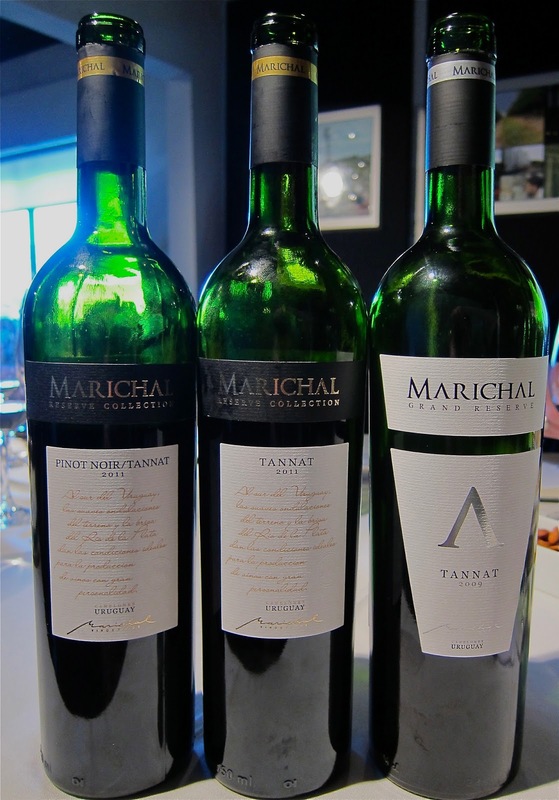 Marichal made less than 100 cases of the first vintage in 2007, but the wine proved popular, so he's up to 750 cases. But as with most Uruguayan wineries, his expansion potential seems limited because it's a small family operation. His great-grandparents, immigrants from Lugarno, Italy and the Canary Islands, started Marichal winery in 1916. Two generations of the family live in the winery compound, and the winery is at capacity. They own 50 hectares of vineyards and manage 10 more for relatives, but they don't buy grapes. They make 10,000 cases a year and Juan Andrés says his long-term objective is to double that, but looking at their facilities it's hard to see how. Unfortunately that limits the number of bottles of one of the more interesting blends you'll ever taste, Marichal Reserve Collection Uruguay Pinot Noir/Tannat 2011 ($16, 13.5% alcohol). The entry is all Pinot Noir -- lively raspberry fruit -- and then it segues into all Tannat, with darker cherry fruit and even some chocolate on the finish. Both stages are distinct, like a cocktail layered into levels, and it works way better than you'd think. It's 70% Pinot Noir because Marichal says, "more than 30% and Tannat kills Pinot." Juan Andrés Marichal, now 33 years old, came up with these ideas after taking over the winery part from his father four years ago. Juan Andrés spent five years in Mendoza, Argentina, getting a degree and working in some wineries. "My father is passionate about the vineyards," he says. "For him, the winery is needed to process the grapes. So as soon as I got back from Mendoza, he said, 'It's your problem'." Marichal's best wine combines the work of father and son. Marichal Grand Reserve Canelones Uruguay Tannat 2009 ($40) comes from a parcel of 34-year-old vines on a ridge of an undulating field; hilltops are rare and precious in Uruguay. It's very fresh and bright, with delightful raspberry fruit that just keeps on coming, intense without weight (13.5% alcohol), with a tannic backbone but no grip. It's not super-complex now, but with all that freshness and power it promises to be. When I first walked into Marichal winery, I thought, this looks old and ill-maintained: it looks like the kind of place where people have been making wine the same way for decades with diminishing returns. Obviously first impressions can deceive, and if you don't believe that, go get a bottle of Pinot Noir/Tannat. Those wines seems really interesting. Going to seek them out. Thank you! I had the pleasure of tasting the Marichal wines at South Lyndale Liquor not long ago. The tasting was led by Juan Andres via Skype from Uraguay. I've rarely experienced such an informative tasting. The wines are distinctive and pleasureful - a winning combination. They are distributed in Minnesota by TKO Wines. Unfortunately, I can't recall the name of the importer.